I am a huge fan of dips ! I like dips of all sorts and among my favorites are bean based dips and cheese based dips. Not too long ago I came across a baked bean dip or a santa fe bean dip on Eating Well Living Thin that had both beans and cheese in it and I just had to try it! The beans in this dip come in the form of refried beans and I made my own using black beans. Refried beans are typically cooked in lard or bacon fat which I did not have on hand so I just cooked up some bacon and left the bacon in the beans which added a ton of bacony goodness to the dip. The cheese in this dip comes from both cream cheese and grated cheese and I used a combination of cheddar and monterrey jack. In addition to the cheese the dip is made extra creamy by adding some sour cream. This bean dip is flavoured with taco seasoning and once again I made my own blend. Of course you couldn’t have a texmex dip like this without some heat so there are some chopped green chilies and salsa in there for good measure. Finally, this bean dip is taken over the edge by baking it to melt all of the cheese into a gooey mess and meld all of the flavours together. 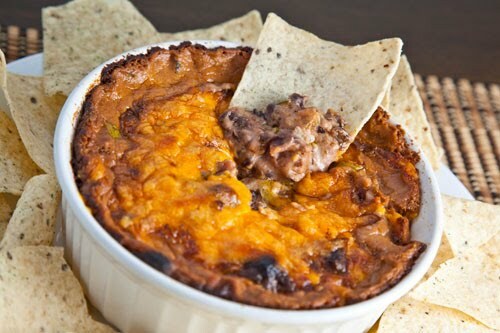 This hot cheesy bean dip was so addictively good! I tried some too soon after it came out of the oven and I was immediatly hooked and continued eating despite the fact that I was huffing and puffing to cool my mouth down. Needless to say, the dip disappeared really quickly and I will have to make some more soon. Mix everything, place in a baking dish and bake in a preheated 350F/180C oven until it is bubbling on the sides and golden brown on top, about 45-60 minutes. i would probably just eat this with a spoon. yum! mmmm this looks good!!! There is something about a hot dip that is just so attractive…. Kevin you did good! This looks so delicious, I can imagine eating it with some crispy just-fried tortilla chips! How is a girl supposed to get skinny when you post recipes that make their mouths water??? Looks delicious! Plus, I am all for bacony goodness. Think I'm going to make this on Sunday for my family. I also am a HUGE dip fan! This looks amazing. I've never made a dip like this before. It would be perfect for a football game party! Oh I LOVE refried beans! I think this would be great for a party or even the Superbowl!! I keep hearing about this deep with cream cheese. I must try this one day. It looks great! I love dips too!!! This sounds so great!! All I have to say it pass the tortilla chips. I remember our other hot dips, Kevin!!! They made me drool then and now I have the same effect looking at this!!!! I just want to eat that dip now. Do you happen to know the size of the dish? Another great dip from you! Thanks! Be still my heart. Seriously. I love dips and I love beans. This is so up my alley. Oh, that looks to die for!! Must make now!! My favorite cheesy bean dip comes from a bar in Boston…I could eat it constantly though, and now that you made this recipe – I can! I am also a huge huge fan of dips because I love chips and dip while watching a movie. I agree … dips are the best! One of the things I love about parties is making, and eating, dips. Your bean dip sounds down-right awesome! We make something similar and it is always a hit. Sounds amazing! Green chilies are another one of my favorite "secret" ingredients in my recipes!!! I always keep them around! Chorizo would be amazing in this too!! Oh my, I wish I can just dig in! This looks good enough to eat on its own! I love Eating Well Living Thin. I look at the pictures very often. I love your blog. You make great things. Perfect for football season – thanks Kevin! Mmmm refried beans. Somebody's ready for football season. Oh my, looks delicious. That would be a dip that I would enjoy. Kevin, I am seriously drooling here! YUM!!!! I love bean dip, and this looks delicious, Kevin! I'll have to give it a try. I usually use it in cold dips, but this would be great with the cooler weather we've been having. Linda – one scoop at a time: The baking dish was 6 1/2 inches across and 2 inches deep. You're a big fan of dips? Are you insulting your blogroll (ha ha ha). Seriously, this looks spectacular and ready for a party. This is right down our alley…And it will be our dinner some time this week! This looks perfect for football – I need to make it soon! I'm on an appetizer/dip kick right now and this is going to hit the spot! Thanks for posting! Thanks for this Kevin, I have always loved dips too. With football season here, this is just perfect! I made this dip last week – it was great! I added some diced jarred jalepenos & a few dashes of Tabasco for a little more heat though. Will definitely make this again! This dip is soooo good, the only down fall is that I could stop eating it until it was all gone! Not good for the waistline! I meant – could not stop eating it DOH!